Stand-alone anti-hijacking system, BlackJax has already saved lives, not just vehicles. You should do nothing in a volatile hijack situation except get out of your car. BlackJax 5 terminates carjackings by allowing the criminal to drive away in your car a safe distance before safely shutting the engine down. With siren blaring and lights flashing, the thief has no choice but to abandon your vehicle. Clifford BlackJax is Clifford`s unique anti-carjacking response system that puts personal safety first while using innovative advancements to ensure that users can recover the vehicle themselves. 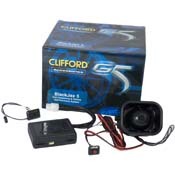 If an armed car thief approaches - whether at a stop light or in a parking lot (where most carjackings occur) - immediately turn over the keys and remote and let Clifford technology take over. Fully automatic: No buttons or transmitters to push when a gun is involved. Just get away from the vehicle. Quick response: BlackJax allows the criminal to drive away a safe distance. Then a few seconds later BlackJax blares the siren and flashes the lights to alert other drivers and witnesses. It then pulses down the ignition system to safely force the vehicle to slow to a complete stop. Siren blaring and lights flashing unable to restart the engine the carjacker has no choice but to abandon the vehicle. Immediate vehicle self-recovery: With the vehicle immobilized a short distance away the owner can recover it. No special tracking units monthly fees or per-use charges. Just follow the sound of the BlackJax siren then enter the PIN code. That`s it - it`s sabotage-proof. The only way to turn off BlackJax is with a secret user-selectable PIN code. If the carjacker tries guessing codes at random BlackJax actively ignores his code entries for the next few minutes.